This week we’re all about tweets—the aviary kind! Clinton County, Illinois is in the midst of spring bird migration, so now is a wonderful time to get outside and look skyward. Carlyle Lake, Illinois’ largest manmade lake, is the top place to find feathered wildlife. Take a walk along the lakeshore, where the vegetation and mudflats are a big draw for numerous ducks and shorebirds. In fact, Carlyle Lake contains the largest wildfowl concentration in all of Illinois, including snow geese, Canada geese, and mallard ducks. In summertime, thousands of double-crested cormorants come to there to nest, making Carlyle Lake the largest breeding ground for these water birds in the state. You’ll also find an abundance of owls, finches and songbirds. So grab your binoculars one of these nice days and head out there for a look. 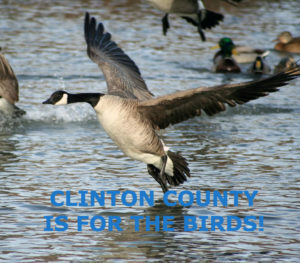 Also notable, the Important Bird Areas Program (IBA) in Illinois has tapped Clinton County for its great avian habitats. Public as well as private lands are part of the program, which works on conservation and breeding of shorebirds, raptors, waterfowl, and wading birds. Carlyle Lake and Eldon Hazlet State Park are two prime habitat locations. Others in the county include Keck’s Marsh, a privately owned farm and hunt club; and Vandalia Bottoms, which is mostly private lands that flood regularly, creating ideal water and food sources for shorebirds. For seasonal information, check out the Carlyle Lake Bird Report. The Audubon Society is also a good resource for local birding. No matter the season, Clinton County is a great place to get outdoors and explore! This entry was posted in Outdoor activities and tagged Carlyle Lake, Clinton County attractions, Clinton County tourism by admin. Bookmark the permalink.